TSR was the grand-daddy of Role Playing Game companies. Best known for Dungeons & Dragons, TSR actually developed many other games (some fine, others less than great), but none ever approached the popularity of D&D. 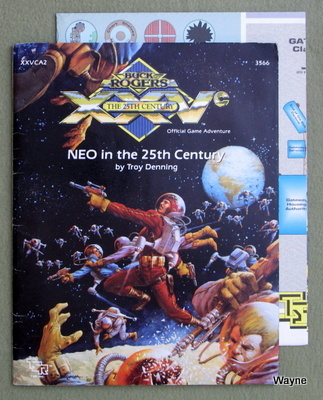 Interestingly, TSR had much trouble coming up with a science fiction RPG, and wanted badly to emulate the success of the Traveller RPG at rival company GDW. 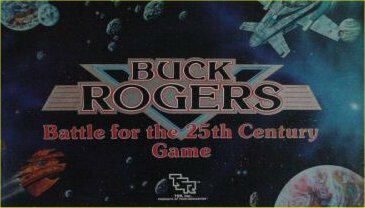 In 1990, they secured the license to the Buck Rogers franchise, and developed a game around it. The game never received a huge audience, but it wasn't for a lack of trying. 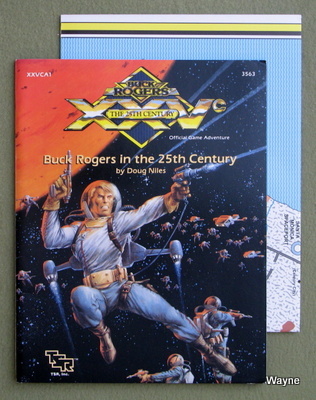 In addition to game supplements, they published Buck Rogers novels, comics, and even a board game. It's more Science Fantasy (like Star Wars) than Sci-Fi to my taste, but I sure admire the love and effort put into the game system. The tone is surprisingly dark for a TSR game of the time, and is closely compatible with TSR's AD&D 2nd Edition rules. And Earth, the ancestral home of Mankind, is a devastated world trying to recover from war and pollution to claim its rightful place in the tapestry of human civiliza tion that now stretches from the blazing plains of Mercury to the barren, icy rocks circling Saturn. Into this arena of intrigue and conflict is thrust a single individual with the power to tip the scales in favor of the planet where he was born. This man is Buck Rogers, born in the long-ago 20th Century but now very much alive and well in the 25th. Over all the centuries in between, two basic facts about humanity have not changed: The first is that Man's greatest enemy is Man himself, and the second is that one man CAN make a difference. 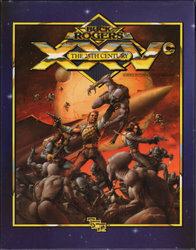 The XXVc™ Role-Playing Game describes the world of the 25th Century in vivid detail. Join the forces of the New Earth Organization and help Buck Rogers and his allies fight the tyranny of the Martians; team up with the other members of your group to buy a spaceship and go into business for yourselves, running blockades or carrying vital supplies and information; make a fortune (or lose one) by visiting the solar system's biggest casino in the Asteroid Belt. All of these opportunities, and countless others, are open to players of the XXVc game. In the world of the 25th Century, the sky is NOT the limit—it's just the first small step on a long and exciting journey! * A foldout referee's screen with all the charts and tables needed during play, plus a set of dice." "How many credits do you have on hand to bribe that Terrine? Does your engineer still have that tool he picked up on Mercury? How quickly does your warrior move, loaded down with all his weapons and armor? How many shots remain in your needle gun? All these questions and more can now be answered with a glance at your new character sheets for the XXVc™ Role-Playing Game. Your skills and their ratings are now immediately accessible. Everything from your weight on various planets to how many charges are gone from your various power packs can be recorded and easily found. Players and referees alike will spend less time hunting for numbers and notes, accelerating your games to the speed and pace of the 25th century!" This was never actually published to the best of my knowledge. Six centuries of disaster, both natural and man-made, have molded Los Angelorg into what it is. The worst of the rubble is impassable, unlivable, overrun with ratwursts, coyodorgs, and other vermin. Here and there in the sprawls are human communities, scraping out a living from the twisted wreckage of a once mighty city. Only in the arcologies, forcibly isolated from the sprawls, can citizens really enjoy the luxuries that the 25th century has to offer. Of course, the people of the arcologies are the foreordained emissaries of Los Angelorg to the Solar System. From their mile-high skyscrapers they have proclaimed their independence from RAM influence, casting it aside with flagrant, possibly premature audacity. The leaders of the Newporg Arcology know that their boldness has cut RAM to the quick, and they are quite certain that they have a traitor in their midst. that's where the newest recruits to NEO come in. 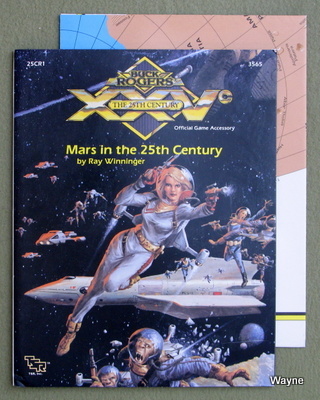 'Buck Rogers in the 25th Century' is an adventure module for the XXVc roleplaying game. In it your adventurers will travel to Los Angelorg to help thwart a vile RAM plot. 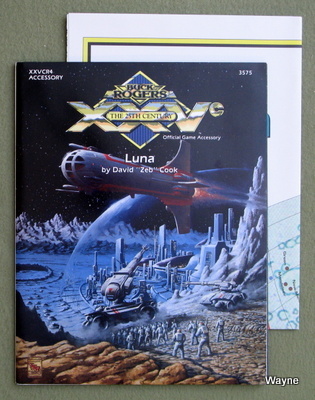 From nightclubs and casinos of Pasareno to the corral-strewn atolls of the Pacific ocean's floor -- from the orbital marketplace of the New Frontier Bazaar to the tangled sprawl of the Los Angelorg wasteland, Buck Rogers in the 25th Century is your ticket to desperate adventure on the Solar System's most devasted, and wild world -- Earth!" "There's something rotten in Coprates. A professor from Mars University hires your band of shady vagabonds to search Jupiter's moons for alien artifacts. Strange, though -- that isn't the sort of job RAM subcontracts. Is the professor pursuing a proscribed area of inquiry? Or is he just a crackpot who can't engage a reputable salvage company? It's a moot point, since after a "chance" encounter with a sultry Terran known as Matahari, they'll be too busy to get anywhere near Jupiter. A murderous computer program named Rutgar.dos will sabotage their ship. A confederation of savage pirates will abduct them. The captivating Ardala Valmar will invite them to be her permanent guests. In fact, just about every government, low-life, and power-broker in the system will be looking for them. Why? Discovering the answer will take the party from the outer asteroids to the satellites of Mercury. Only quick thinking and skillful use of weapons and equipment will keep the player characters alive! • 64 pages of thrilling adventure!" 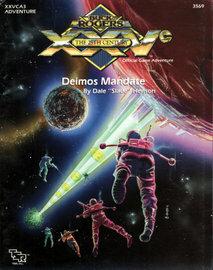 "Deimos Mandate, the first installment in a trilogy of XXVc adventures, is designed for 3 to 6 characters of levels 4 to 6. 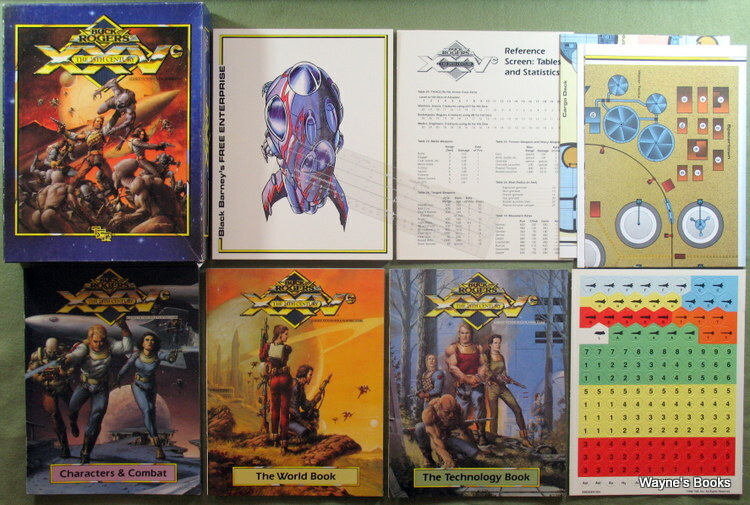 You need the XXVc Role Playing Game boxed set in order to play." * Details on the Pavonis Space Elevator, one of the technological marvels of the solar system, and generic maps of the most common types of levels in the Elevator. * New technological items your characters won't be able to resist. * New ships your characters may or may not get their hands on. * 32 pages of blood-sweat-and-tears adventure! 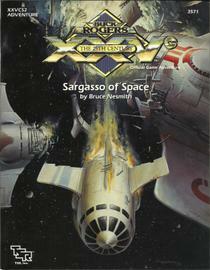 "Sargasso of Space is an adventure for the XXVc role-playing game, designed for 3 to 6 characters of 5th to 7th levels. 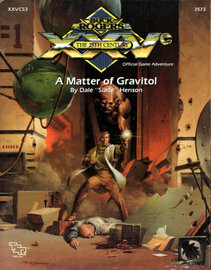 While it is a sequel to XXVCS1, Deimos Mandate, it is not necessary to have played that adventure in order to play this one. • A map of the planetary positions at the beginning of the adventure. • Information on bottles: self-contained, self-sufficient micro-worlds. • Maps of two of the most important bottles the party will visit. • 32 pages of race-against-the-clock adventure!" "December 4, 2456; 18:05 GMT. RAM has broken a long-standing treaty with Venus. Ishtar has created a new form of gravitol that can be manufactured anywhere in the solar system, and RAM wants it. RAM launches a battle fleet, successfully capturing Venusian orbital space. The search is on for the scientist responsible for the new gravitol V12. RAM will stop at nothing to gain the knowledge she holds. Can you find her before RAM does, and convince Venus to help NEO in their quest for freedom? • Thirty-two pages of chair-gripping action and suspense! • New equipment and ships you can't do without. 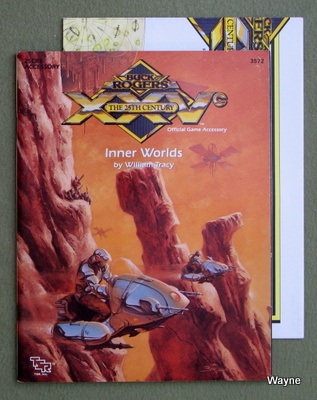 • Three ship-to-ship space combat scenarios to spice up any XXVc™ campaign game!" "You're heading toward Luna for a little R&R after your last mission for NEO. Thoughts of the pleasure domes drift through your mind as you gaze idly at the commo board. Your reverie is shattered by an unexpected message: a top secret, Code Omega, "squeal" transmission. There will be no questions asked — just take the mission and do it. You quickly unscramble the transmission and watch the viewscreen light up with the face of Commander Turabian. His look is grim as he relays his information. "Colonel Willis January is defecting to RAM. That's right, defecting. Your mission is to intercept him, using whatever means necessary. The information he knows about NEO is vital and could destroy the organization. You didn't know it, but January was your commanding officer for your last mission. I don't have to tell you what that means to your survival should he successfully defect to RAM." A chill washes over you. Your life won't be worth a plugged credit if January pulls this off. "By the way, Luna has offered January asylum until RAM agents pick him up. They won't take kindly to interference with their protection. You'll have to take care of the January problem and not antagonize the Lunar government at the same time." 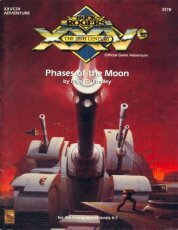 Phases of the Moon is a 32-page adventure for the XXVc role-playing game, designed for four to six characters of levels 4-7. 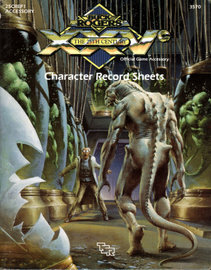 You must own the XXVc science fiction role playing game rules in order to play this module." To the executives who run the immense corporation known as RAM, Mars is as close to Paradise as any place in the solar system. To the people who make up the bulk of RAM's military and civilian work force, Mars means security and opportunity... as long as they remain loyal soldiers and employees. To the loners and strange creatures that prowl the planet's vast deserts, Mars is much as it has laways been: A world or wilderness, solitude, and danger. To the inhabitants of the rest of the solar system, Mars is at worst an enemy and at best a threat. The Martians run the most powerful -- and the most power-hungry -- planet in the solar system, and they fully intend to keep things that way..."
To the executives who run the immense corporation known as RAM, Earth is a ball in space suitable only for exploitation. Except for its raw materials, nothing of value comes from here, and nothing ever will. RAM executives all originated from Terran genetic stock, but they were, of course, "the only good thing ever to come from Earth." To Mediabloc from Mars, Earth and its terrorists present good ratings but bad field experiences. The planet is in awful shape, its best areas barely civilized and surrounded by ruins. Reporting the news is dangerous business with NEO and Phoenix terrorists constantly assaulting the law-enforcing RAM Terrines. To those on Earth, this is home, and home is worth fighting for. They feel that RAM's exploitation of the planet and its peoples must stop, otherwise Earth may never recover from the maltreatment she has received for the last 600 years. They feel so strongly about this, they lay down their lives daily in her defense. Earth: derelict, bad assignment, ruin of the solar system, home. All these words describe Earth, but do they do it justice? Can they fully describe the ruined sprawls which house so many millions? Do they adequately depict the desperation of the Firms fighting for freedom from RAM rule? Can they explain the pride her natives hold for their home? Explore the Earth in the 25th Century and find these answers for yourself. * Vital information regarding the Firms at work to free Earth from RAM control. * Radiation and its genetic results. * A complete overview of Earth and the disastrous ramifications of war and exploitation. * New technologies to spark up any campaign. IMPORTANT! 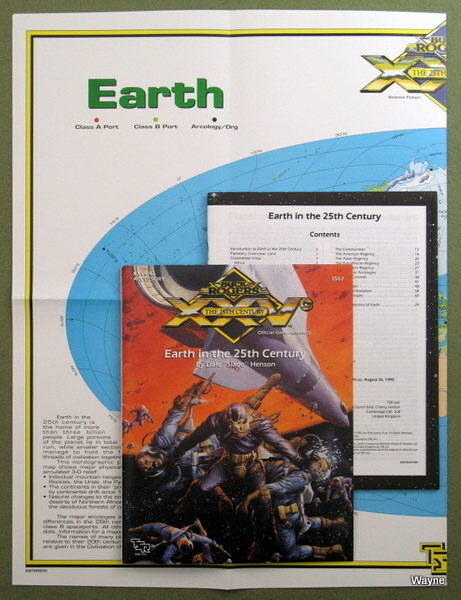 Earth in the 25th Century is designed for use with the XXVc™ Role-Playing Game. You must have a copy of it to to make full use of this sourcebook!" "Mercury and Venus: The two innermost planets in the solar system. Their names evoke a romanticism of an earlier era, of the speed and beauty of gods. However, in reality there is little to romanticize about. Mercury: Perhaps the place-names based on musicians, writers, artists, and intellectuals were chosen to reflect the culture which has grown to prominence on this sun-ravaged planet. The rift between the decadence of the Sun Kings (especially the Gavilans) and the Spartanism of the Miners is great and widening daily. is found only on the high mesas of Ishtar and Aphrodite. In Inner Worlds, you will find information on all this and more. Details about the economies of both worlds, their peoples, their relationships with RAM and NEO and the delicate balances of power caused by those relationships are all within these pages. Background on the physical geography and native races is also here. In addition, you will find a full-color map of both planets, providing excellent reference for all pertinent planetary information." "Defiant outpost of freedom against the oppressive forces of RAM colonialism? Coterie of money-grubbing bankers without the moral fiber to take a stand? The colony that works? Take your pick. To the ever-frustrated executives of RAM, Luna is the galling thorn in their corporate side. Fiercely independent and openly contemptuous of RAM power, the Lunarians have fought to retain their precious neutrality in the raging conflict around them. To the poor and struggling NEO organization, Luna is the source of desperately needed arms and equipment — at a price. Possessing some of the finest technology, the bankers of Luna have made weapons a highly successful business. To the average working man, Luna is home. Grown tough in an unforgiving environment, the people of Luna are determined to stay safe and secure from the chaos and destruction that surrounds them — at any price. Luna is a place of industry and opportunity. Yet, beneath the surface lies intrigue and corruption. Famed in equal measure for its technology and neutrality, Luna is threatened by invisible cracks beneath the surface that could destroy its fragile structure. For players of the XXVc game, here is the chance to save Luna — or grab it all for themselves." "Belters. The wild, wooly frontiersmen (and women) of space in the twenty-fifth century are alive and well in the asteroid belt. Listen to what an anonymous longshoreman from Juno has to say about life out on the edge. 'It takes a special kind of individual to carve out a life here in this ring of rocks, an individual who knows what's important in life and is willing to work for it. Not that everything here is uncivilized, oh no. Ceres is the seat of government and civilization for the entire Belt; For-tuna is known far and wide for the medical research conducted in its zero-gee labs. You want wild? Head for the casinos of Aurora, or better-yet to Interamnia —that's where the real wildlife is! There's fortunes aplenty to be made out here, what with the shipping trade on Hygeia (that's where they make the bottles, you know?) and here on Juno, and the mining on Davida. I hear it's best to keep away from Pallas and Thule, though—of course, no one goes to Thule voluntarily anyway. Think you'd like to visit these space rocks? Read the information in this guidebook before you make your final decision, friend; sometimes it's easier to get there than to get home again." "Five Centuries of technological innovation have created incredibly fast spacecraft, vehicles using very little fuel or alternative fuel sources, micro-mechanics, and sky-scraping buildings reaching into high orbit. All of these tremendous breakthroughs do not compare with the introduction of genetic manipulation. Mankind found a way to delve into the DNA structure of every animal -- including humans. 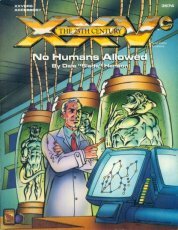 These genetically altered races, or 'gennies' serve a multitude of uses. Some sail the bottom of oceans in an eternal quest to clean centuries of waste. Some skim the upper atmosphere of Jupiter, engaged in hydrogen consignment. Still others fight the wars no one else wants to fight, dying so humans don't have to." "Your character has traveled the solar system. He's had close shaves, some of them closer than you would like to remember. As an experienced adventurer, he's been everywhere worth going and done everything worth doing. He's seen it all. Now, he can amaze his friends and confound his foes with some of the system's hottest new technology. Hardware introduces 64 pages of exciting, cutting-edge weaponry, gadgets and vehicles, From-lasers to grasers, from transatmospheric vehicles; to scram rockets, to the Venusian aerostate shuttle, from slow glass to ferrofoam, its all presented here in the Hardware book. NEW hand-held and ship-mounted weapons that give your character — or his enemy — a decisive edge in any combat situation. GADGETS galore, including a wide variety of communications gear, sneaky electronics that only a rogue could love; and exotic inventions to spice up the old: weapons locker. LOTS of new vehicles, including rockets, fight planes, land rovers, arid submersibles! (Referees: This book gives you many new opportunities to get rid of PC's loose cash!)" 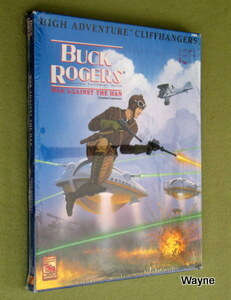 Unlike the earlier XXVc Buck Rogers game -- which threw out most of the traditional BR backstory -- The High Adventure Cliffhangers box set returns back to the pulp roots of Buck Rogers. 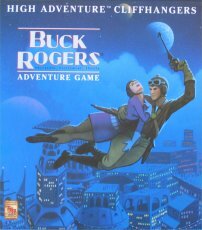 "This adventure source pack is intended to create an ongoing campaign for the High Adventure Cliffhanger: The Buck Rogers Adventure Game rules. The War for Freedom Continues! Deep within the Grand Canyon lies a secret Han airbase. Hidden here is an irresistible super-weapon that will bring the rebellion to its knees. The only defense is for a small band of heroes to infiltrate the base and foil the plot before final disaster strikes! Armed with the best available weapons, and allied with both native American freedom fighters and the mysterious Golden Dragon Society, the heroes must attempt to stop the unstoppable. 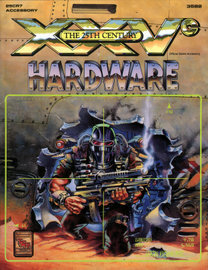 A 32 page full-color World at War book, which expands the world giving loads of information on new technologies, new places, and the people of the 25th Century. 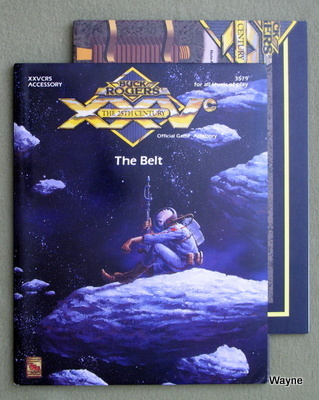 A 48 page, full-color Campaigns vs. the Han book, which shows GM's how to construct campaigns, giving expanded tables for quick creation of adventures and gaming sessions. It also has a great adventure that pits the player characters against the Mongol Overlords. 2 full-color, poster-size maps put the 25th Century on your gaming table, including a large-scale playing map of a Han airship. Lots of stand-up counters and terrain tiles."